St Francis of Assisi is a rich and diverse community. We believe that Christ is at the heart of our school. As a school community we endeavour to model, respect and live fully our Catholic faith; whilst recognizing, respecting and celebrating the values and beliefs of all parents who seek to send their children to our school. Our children, staff and governors are all very proud of our school. Our Mission statement reflects our belief that, as a school community, we work together with our parents and our parish, to provide a caring, stimulating and nurturing environment, where every child can discover their true potential and grow closer to Christ. We are conscious of the need to provide our pupils with an outstanding learning experience. Our curriculum is rich, broad and balanced and as a school, we are keen to foster in one another a true love of learning. Working in close partnership with our parents, carers, pupils and governors we constantly review and evaluate our achievements so that we can continue to grow and make St Francis the best school it can possibly be. As a two-form entry primary school, St Francis’ offers a total of 420 pupil places from Reception age (4 years) up to school Year Six (11 years). This means that there are sixty places available each September to enter the school in Reception Year. The Governors aim to offer a distinctively Catholic education. They expect that parents applying for places for their children will accept and uphold the Catholic character and ethos of the school. Nevertheless, the school fully respects the beliefs of parents and children from all denominations and faith backgrounds. Children are taught respect and tolerance for others and there is provision in the religious education programme for the study of different faiths. 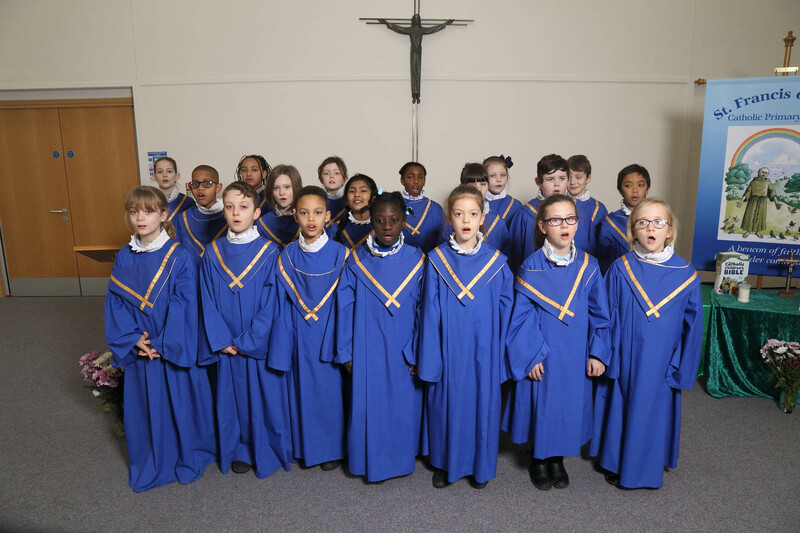 The school was set up primarily to serve the Catholic community in the Crawley and Horley Catholic Parishes. We have extensive school grounds which lend themselves to numerous opportunities for an enriched curriculum. There are two hard play areas and a large field. Our outdoor space also includes our ‘Big Garden’ designed by the pupils, which contains a wildlife area, a pond and an allotment area, all perfect for our outdoor learning curriculum. We are currently developing a Quiet Garden, for peaceful reflection. Our school has fourteen classrooms, each of which are fitted with touch screen tvs and computers/laptops to cater for different learning styles and enhance the learning experiences for all pupils. We also have a Special Educational Needs area equipped to accommodate one to one specialist teaching and small learning support group work. Central to our accommodation is our multi-purpose school hall; used for Physical Education (PE), Collective Worship, School Masses, School Productions, Presentations and, not least of all, a dining room. Our school also boasts a chapel, Reception / administration block, a meeting room, an ICT suite, a music room, an art room and a library. We also have our own kitchen which enables us to offer hot school meals. More recent building development work has provided outstanding Early Years facilities and a new Extended Schools area for the Breakfast and After School Clubs. The school has ramped entrances allowing easy access for wheelchairs and a toilet for wheelchair bound individuals. The school has an access plan that outlines how it intends to continually improve accessibility for people with disabilities.